For me, the first time I visit a country is the most exciting. New environment, new people, new food, new language, new climate. And of course there’s the planning of day trips, which during my first stay in Mallorca, I found a bit overwhelming. The island has so much to offer that I found it hard to choose where to spend my limited time (because work). So, here are 5 recommendations for awesome days out! Had a long Sunday lunch together with another co-worker at El Arenal’s #1 restaurant, Bar Andaluz. This is the type of restaurant I’d have walked straight past if it hadn’t been pointed out to me. Lots of locals, flavourful tapas and friendly staff at an affordable price. We went to a small, unknown rocky beach afterwards to watch the sunset. 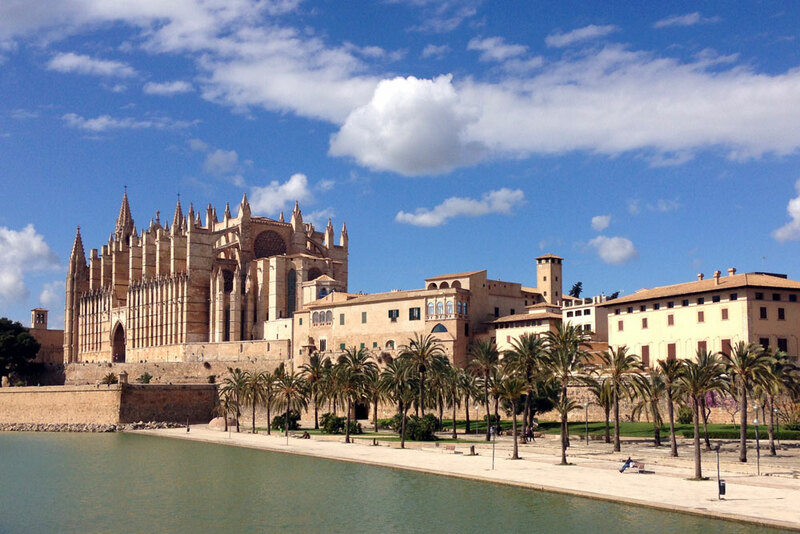 One Saturday I visited Palma, using my 10-trip bus ticket (€10,00 at the tobacco shop) to get there. I just wandered about, using my trusty Google Maps to guide me when needed. Plenty of photographs were taken. When I was tired, I sat in the grass among the flowers with a priceless view of the La Seu cathedral, listening to the splashing of the fountain and someone play guitar on the terrace beneath me. I used Meetup.com for the first time and became a member of The Mallorca Hiking & Outdoors Group. Together we hiked along the Southern tip of Mallorca from Faro del Cap Salines to Faro de la Torre den Beu. I enjoyed the experience so much that I joined the group a few years later to hike Puig de Sant Miquel, my first mountain top. I only needed to contribute a few Euros to fuel, but both of these days were just incredible. Taking the 100 year old Tren de Sóller was unforgettable. When I arrived I drank some of the best orange juice I’ve ever tasted (oranges are what the village is known for). I navigated through narrow streets to reach the Jardín Botánico de Sóller, where I was surrounded by an incredible diversity of local flora and honey-scented air. Afterwards I took the vintage tram to the Port, and just sat, looked into the distance and listened to the gentle sounds of the water. One I’ll visit Mallorca for a second time for: to visit Mallorca’s grandest caves, Coves del Drac in Porto Cristo. I hope that my personal recommendations help you a little when you plan your own day trips during you stay at BednDesk. I’ll be back to explore more of the island! Hey, I’m Noëlle. 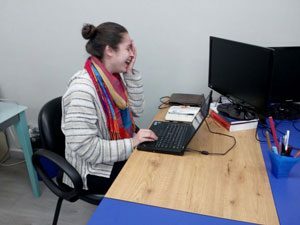 I changed my life 180° by living in South Africa for 4 years, where I worked remotely. I’ve been a baseless digital nomad since December 2016 and travel the EU carry-on only. I spent 1 month at BednDesk in March/April, and will be flying off to Sicily and Malta next. The Mediterranean is a great place to be.